My breed was developed by S.E. Shirley, who was also founder of the The Kennel Club in England in 1873. I have a friendly, outgoing personality and am devoted to my people family. My coat is of the wash-and-wear variety, requiring no special grooming techniques or talent and it comes in solid black or liver color. I am happy living in the city if I can get enough exercise to keep me fit and healthy. When fully grown, I am between 22 and 23 inches tall (55.9 to 58.4 centimeters) and I weigh between 60 and 70 pounds (27 to 31.5 kilograms). We have no Flat-Coated Retriever Breeders listed at this time. 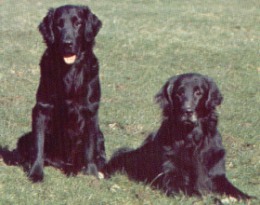 Click here to place your Flat-Coated Retriever Ad!